The rides, the roads, the facts!  Cycling Nepal: Over the hills and far away!  Cycling Cambodia: The Wild West of Southeast Asia!  South India: Chennai to Goa around the coast!  Across mysterious Laos & Vietnam!  Vietnam: Around the Mekong Delta!  Malaysia: Up the East Coast!  Indonesia: The Volcano Tour! 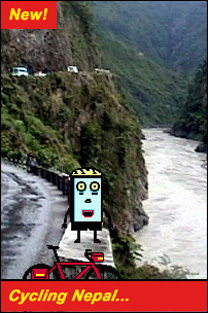 Update March 2010: Felix and Mr Pumpy are currently cycling from Jerusalem to Kashmir. 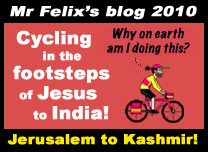 Go to blog: Cycling in the footsteps of Jesus to India! Note: Biking Asia is a noncommercial site. Felix and Mr Pumpy do not run cycling tours. Words and images by Felix Hude. © Felix Hude 2010 All Rights Reserved.